Don’t mess with a bull; you might get the horns. Today was moving day! I’m now back out at the Earthship, the off grid place way out in the backcountry near Cerrillos, New Mexico, where I’ll be housesitting until mid January. Everything I own, including the dogs, once again fit neatly into my Subaru and I moved it all in one easy go. This evening, I took a four-dog sunset hike down my driveway and across the road to Cerrillos Vista, a long straight dirt two-track with a million dollar view. As I opened the gate I noticed a handful of cows grazing in the distance along the path, right where I was planning on walking. 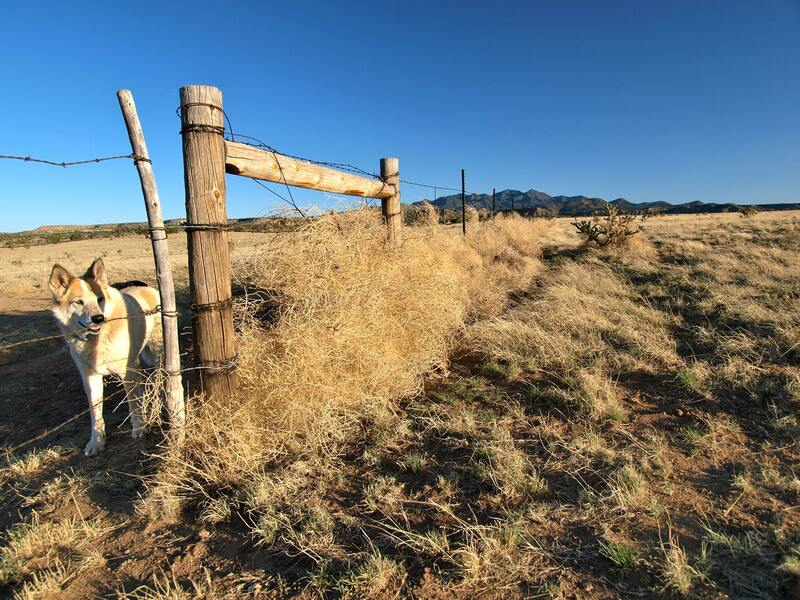 I decided to head that way anyway; Cerrillos Vista parallels a barbed wire fence and I could always send the dogs through and hop to the other side if the cows didn’t cooperate. As I approached the herd – five adults, all with sharp curved horns, and three half-grown calves – the bull raised his head and stepped forward to put himself between his family and me. He wasn’t alarmed, just wary. He moved calmly and then stood quietly, head up, ears straight sideways, watching to see what the dogs and I would do. Dio and Bo moved first, shooting forward ahead of me, their throats rumbling. At my sharp No! they both stopped and stood still, letting me take point. As I walked, all four dogs fell into a loose box around me. Freckles, stone cold deaf and extra wary of hooved animals after a close call with a dog-hating mule, ducked beneath the wire fence and followed along from the safety of the other side. As I walked towards the bull I yelled Hey! and raised both my arms rapidly, holding my hiking stick above my head. At the motion, he tossed his head and snorted a warning to the others. I waved the stick again and yelled Git! and he turned and herded the others away from my path. They all gathered behind a juniper, in a circle around the calves, the bull in front of the group, on point, watching me. In my experience, the key to negotiating personal space with animals is to know that once they make a decision – to attack or retreat – they usually stick with it. Once I had the dogs in check and the cows on defense, I knew they’d all likely stay in that mode. As I approached the cows, I held my stick ahead of me, but otherwise didn’t threaten them further. As we passed by, the bull’s eyes and horns followed us, but his feet stayed put and the dogs and I went on our way peacefully. 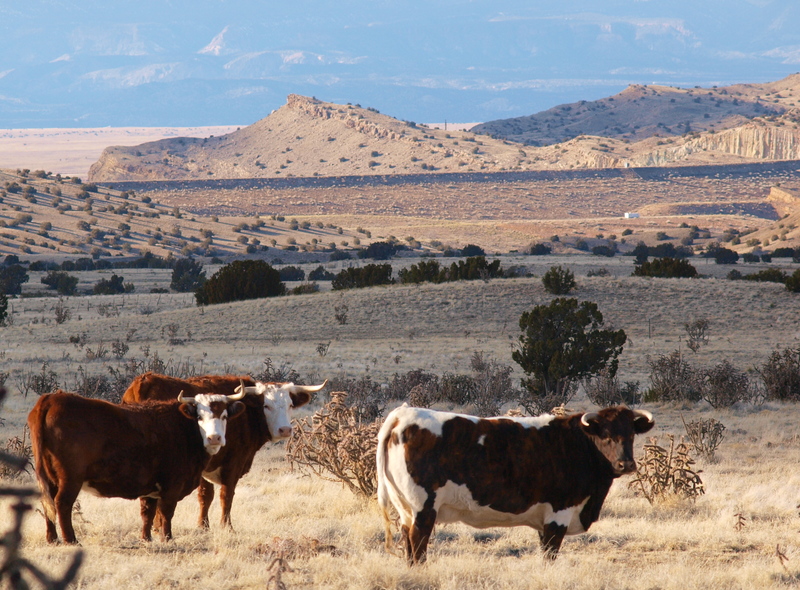 This Wild West place I live is zoned rangeland and populated by very few people and a menagerie of feral cattle, roaming horses and desert wildlife from coyotes and bobcats, to jack rabbits and ravens. 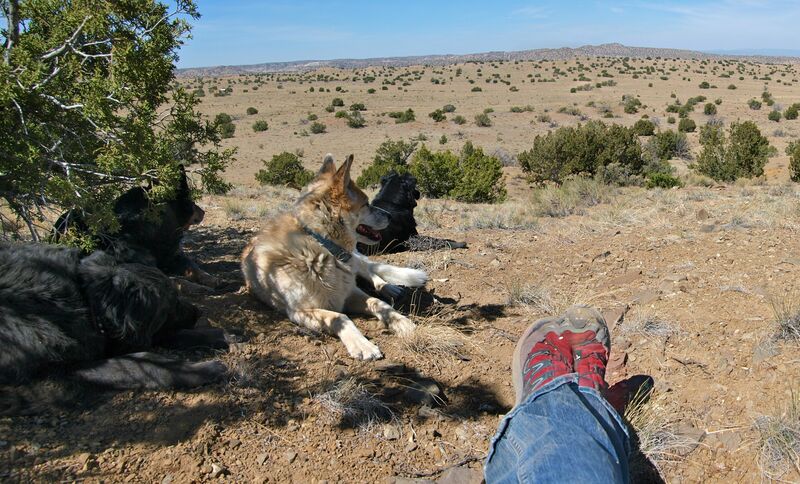 Close animal encounters are not uncommon out here and safe hiking with four unleashed dogs (my two, the blonde coyote and Bo the aging cattle dog) takes a lot of awareness, confidence and clear cross-species communication skills. Some argue that it also takes a weapon. Just the other day one of my favorite neighbors, Cindy, gave me a lecture about carrying a weapon while hiking around here. 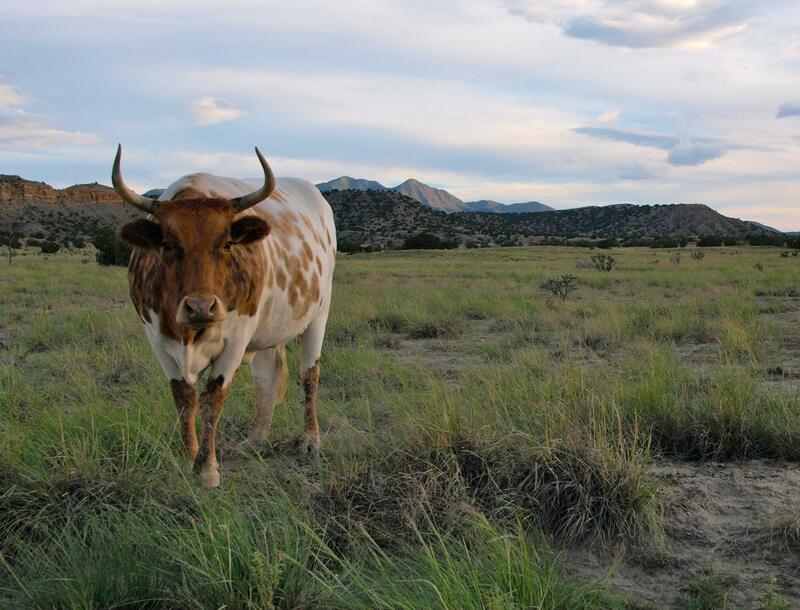 Not necessarily for people – this is remote, private property and I’ve yet to meet somebody walking out here whom I didn’t already know – but for animals, especially feral cows, horses and dogs. In general, wild animals have a healthy respect for space. As long as you give them theirs, they will gladly and instinctively give you yours. But domestic animals that roam freely can be dangerous. Sometimes they’re missing that fear that keeps wild animals at bay. Curiosity brings them too close and then things get dicey. A few years ago, before I lived here, a pack of wild dogs roamed Tierra Vista. There were seven or eight of them and they were hungry and aggressive towards other dogs and unafraid of people. After several incidents, a neighbor shot three of them and the rest disappeared. I’m glad I didn’t live here then. Yes, I have stepped between a charging horse and my dogs and I would do it again. Absolutely. Without hesitation. So I got a weapon. A stick. Don’t laugh. Properly wielded, a stick can be a pretty powerful tool. Wild, feral or tame, all animals pay attention to a human holding a stick and once you’ve got their attention, most are easy to convince they should give you some space. The other good form of protection for hiking is pepper spray. I don’t mean some little can of jogger mace. I mean bear spray that shoots 30 feet. The idea is to spread an unpleasant warning cloud between you and the animal to discourage them from getting any closer. If they do decide to attack, you hold your ground until you can discharge the rest of the can in their face. I have carried bear spray in the past, when I was living in Grizz country in Montana, though I never had to use it. I draw the line at carrying a gun. Hiking with a loaded gun is a terrible idea and if it’s not loaded then it’s less useful than a good aerodynamic throwing rock. Almost everybody living out here owns a gun. I know at least one neighbor out here who keeps a loaded .22 in their jacket pocket at all times. Carol has a .44 loaded with snake shot, tiny pellets that sting like hell and a big old shotgun she last used to dispatch a 5-foot diamondback she found on her porch. Me, I’ll trust in my stick. 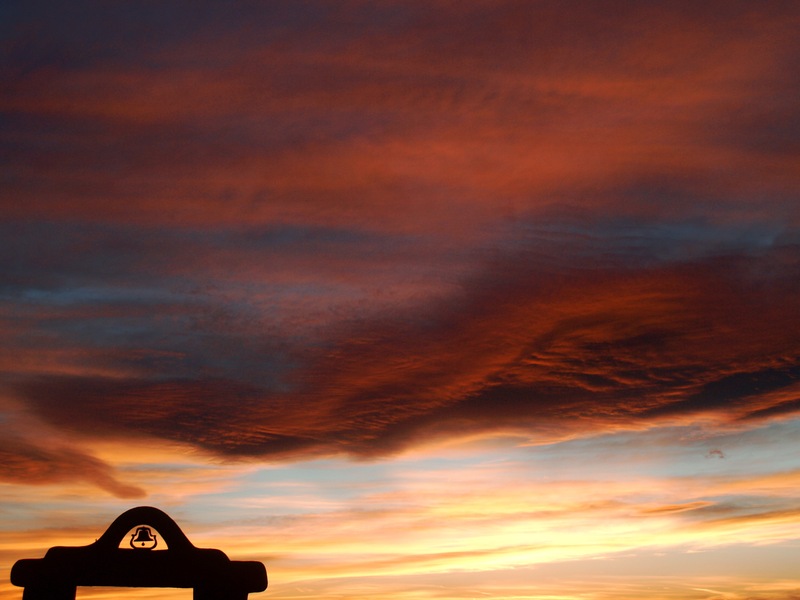 This entry was posted in Bowie & D.O.G., Cowboys & Horses, Hiking!, New Mexico, Photography and tagged animals, bull, cattle, cows, desert, dogs, encounter, feral, hiking, pepper spray, wild. Bookmark the permalink. I’m with you on the “no guns.” Except when an animal is badly injured and too far from vet. help. Your stories are always both entertaining and thought-provoking. Thankyou. I’m with Carol on this one, but it’s a personal choice. I fully respected a person’s choice NOT to carry.